This Hand Crafted Elegant Album was designed to tastefully display this bride and groom's wedding photography from The Lodge at Sonoma. An ivory leather cover with copper foil imprinting complimented and contrasted the album's interior black mats, copper liner, and copper page gilding. The combination of matte black and metallic copper foil creates a very striking presentation. 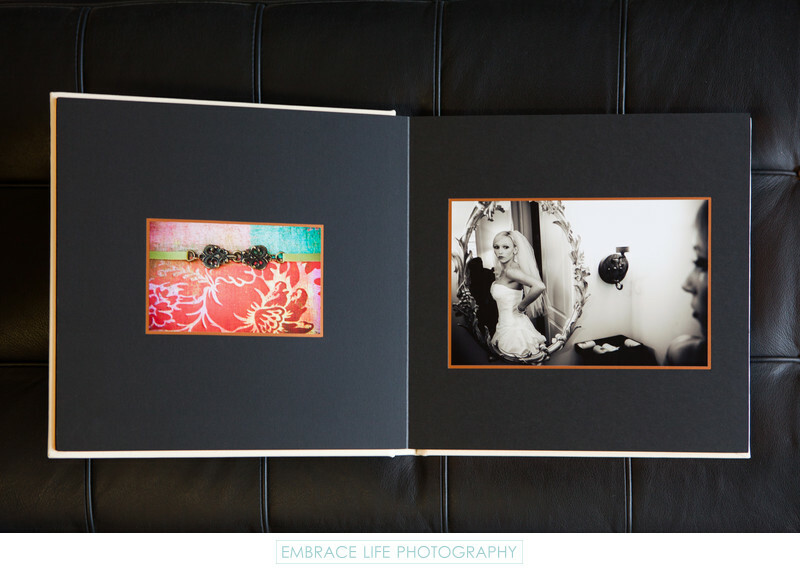 Hand Crafted Elegant albums are available with white, ivory or black mats; white, ivory, black, red, copper or gold liners; white, ivory, black, red, copper, gold, or silver gilding and imprinting. Location: 1325 Broadway, Sonoma, CA 95476 .